This post is a mushy love letter to the folks at Disneyland, whose kind invitation to their annual #Halloween Time Media Day allows me to bask in all my Disney dreams… despite the fact that my child is no longer a little kid. I am living proof that you don’t have to be a kid or have young children to have a good time at a Disney park. You can even be a woman in your 50’s and have a great time there. It’s just that the experience becomes a little different. 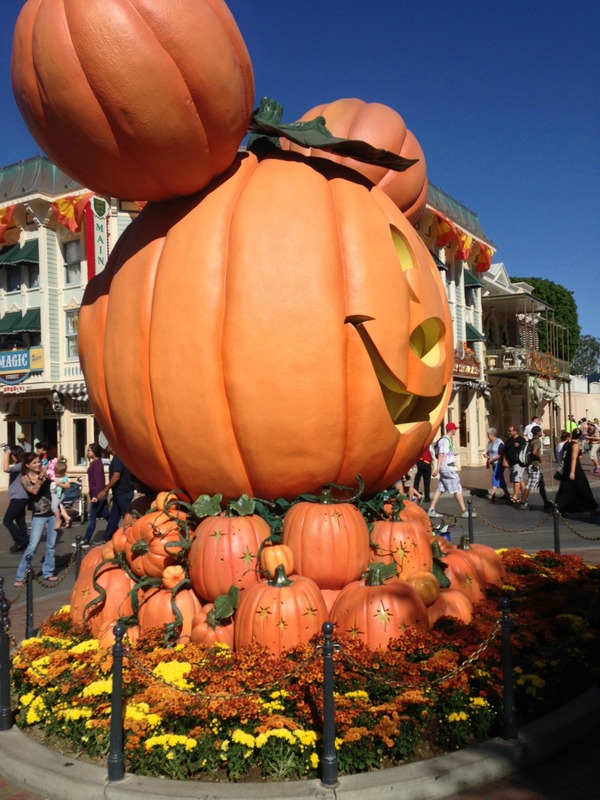 This giant Jack o’Mickey greets visitors to Disneyland ‘s main park at Halloween Time. And every year, I take its picture. My sister, Linda, is also a Disneyland devotee. She dropped everything this weekend and drove down here from Sacramento so she could enjoy the Halloween festivities with me. “I really want to spend some time at California Adventure,” she told me. The last time we visited the Disney parks together, California Adventure was torn up for its $1.1 billion renovation, and she didn’t get to see much of it at all. It’s gorgeous now and better than ever. But she wanted to see that for herself. As it turned out, the Media Day event included a reception in a “soundstage” on the Hollywood Backlot area of the park, so that was our first stop. On the way, Linda got her first glimpse of what a billion dollars buys you these days. 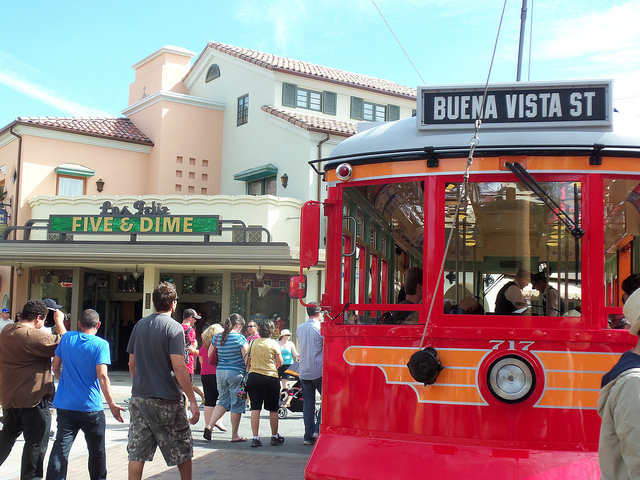 I took this photo last year, the first time I got to see the new Buena Vista Street entrance to California Adventure. “This is beautiful,” she said as we wandered down Buena Vista Street, Disney Imagineering’s re-creation of Los Angeles circa 1923, the year a young Walt Disney arrived in Southern California. Buena Vista Street is very similar to the original park’s Main Street: It greets visitors by setting the stage for all the magic that’s to come, with period buildings, shops, restaurants and transportation (in this case, a replica of the old Red Cars, which criss-crossed the region and enabled residents to travel from one end of the city to the other). Saturday was the final day for high school seniors applying to college to take the SAT, and so it was already past lunch time when we arrived at the Park and once we had checked out the reception, my daughter and her friend went off on their own, promising to check in with me by text every couple of hours. My friend Marsha (who blogs at Sweatpants Mom) joined us in a quest for something good to eat. Our first stop was the Carthay Circle, a restaurant designed to look exactly like the movie theater where Disney’s Snow White premiered in 1939. I remember seeing that theater, and also remember it being torn down in the late 60’s. This is probably the most elegant dining establishment inside either of the Disneyland parks — it is also tough to get a reservation on as busy a day as Saturday (I know — I tried to get one two weeks ago and the only available time for dinner was 4:00 PM). So I suggested we mosey over to the Wine Country Trattoria, where I’ve always had good luck being seated. I had tried to take my sister here on her ill-fated previous visit to California Adventure, and we simply could not find the entrance behind all the construction. We were ushered to a table right away, and that’s where we made our first California Adventure discovery: There were cocktails on the menu. Now, California Adventure has always differed from the original Disneyland Park by selling wine and beer… but it you wanted a real mojito or martini, you still had to go to one of the hotels or Downtown Disney. “Do you really have a full bar here?” Marsha asked. Our waitress assured us they did, and in the spirit of “if you build it they will come,” she ordered a margarita with her lunch. I toyed with the idea of having a cocktail and decided I might fare better on a hot afternoon with something a little lighter, so Linda and I each had a glass of white wine. Either way, we decided that feeling free to order a drink was a major benefit of enjoying Disneyland without our kids. 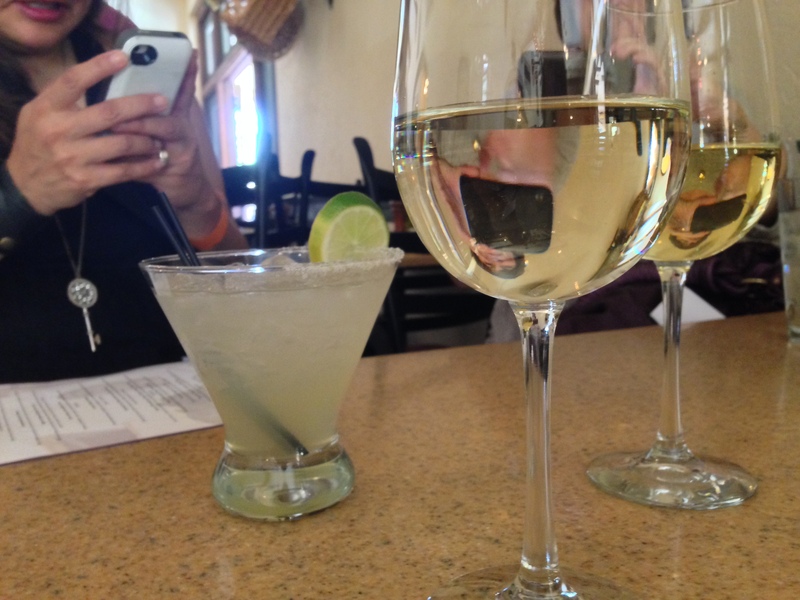 Yes, when bloggers get together for lunch it is totally normal for them to Instagram their drinks. “Uh, maybe this isn’t such a great idea right after lunch,” Linda noted as we climbed into our “rocket.” By that time, it was too late. Thankfully, we made it through the ride with no ill effect, and later rode the California Screamin’ roller coaster, complete with 360-degree loop. What can I say? We may be middle-aged but we’ve still got it. We finished by watching the spectacular Halloween fireworks show. This is another feature that is all-new every year: The one thing you can expect is that you will walk away saying it was the best fireworks you’ve ever seen. The Park started to empty out after the fireworks, and we toyed with the idea of getting on at least one more ride. But my daughter and her friend put the kibosh on that plan: We found them sitting on a bench and looking really sleepy. They were tired and wanted to go home. HAH! Score another one for the middle-aged moms, who were still up for more Disney fun. Then again, by the time we hit the freeway, we realized the girls’ wisdom in exiting when we did. We were tired, too. The Fitbit I wear reported that all in all, we had walked over six miles. “You know, it really isn’t possible to do all of Disneyland in one day any longer,” my sister remarked. She’s right. There is so much more to see than there was when we were kids, and the wait times for the “E-ticket” rides seem even longer. I’ve gotten used to leaving the Park still wanting more — which isn’t bad for an attraction that’s thought of as just a children’s place. I guess it just goes to show you that some kids never grow up. DISCLOSURE: I received four park-hopper tickets from Disney to visit the park during their Family Media Day event, so I could experience this year’s Halloween Time. I was not compensated to do so and all opinions are my own. The print and broadcast media who were also invited don’t have to offer one of these disclosures — just those of us publishing on the Internet. I love that you can enjoy Disneyland no matter what stage of life you are in. We also had a fabulous time and we loved seeing all the Halloween decorations!